Drums are notoriously difficult to mic. There’s just a lot more sonic action going on inside a drum than in most other instruments, and they create a layering of harmonic overtones with every note. This helps the drums sound good in any key but can be too complex for many microphones that are suited for voice or other instruments. Bass drums in particular are difficult to mic well. The powerful attack on a bass drum can be too much for many microphones to handle and will come across as distorted if you’re using a microphone with a lower SPL rating (sound pressure level rating). And when you factor in the size of a bass drum, many microphones have a difficult time finding a good placement. To get the best quality sound, we recommend using a microphone designed with kick drums in mind. There are many great bass mics out there, and some of them are very affordable. In this article, we go over what you need to know about recording kick drums and review our choices for best bass mics. Drums add a few little wrinkles to think about when you’re setting up to record. Here are some things to think about before making your purchase. The sound source is always the most important part of the signal chain. You’ll get a better result from a good sounding drum set with cheap microphones than you will with million dollar mics on a terrible, out of tune, set. If you’re going to be recording, I recommend using a drum dial or something to get a more accurate tuning. Bass drums can be particularly problematic here. There are hundreds of different techniques to tightening the sound of the bass drum. Some people will stuff foam, pillows, or blankets in the shell. Others will place products on the beater head to weigh it down and shorten the vibrations. The best sound for a bass drum will come from within the drum. For this reason, you want to have a resonant head that has a microphone access hole. Some people even take the resonant head off entirely. Controlling the sound of the drums is an essential part of micing. As you would probably expect, the approach to live sound is different than recording. In live sound, your primary goal is to control the volume. It won’t make much sense to mic the drums if they’re louder than what ends up coming out of the monitors. The basic goal is to keep the acoustics of the drum controlled so the sound guy can make sure they come through evenly from the monitors and speakers. For large venues, this may not be a problem. If you’re doing live sound in a small to medium-sized venue, you’ll want to invest in a drum shield. In recording, the room you’re in is going to play a big part in the quality of your sound. Generally, you want a room with very little reverb. If you’re tracking the drums first, some natural reverb can sound attractive but will start to sound muddy and sloppy when you bring the other instruments in. A room with good dampening can make all the difference when it comes to mixing. Most often, drums will be recorded in a small room with the door open if possible. This will help to keep the sound tight and avoid echoes. A solid kick drum microphone takes a lot of abuse. It’s consistently placed close to the source, and it’s exposed to very high SPL’s. If it’s on the road, it’s inevitably going to get dropped or generally mishandled over time. Good kick drum microphones should be well built with strong mounts – features typically found in dynamic microphones. Dynamic microphone technology is stronger than what you will find in condenser microphones or ribbon microphones. A well-made condenser can also work, and condenser mics typically have a slightly better tone. Using a ribbon microphone for drums is almost never the right decision because they’re incredibly fragile. There are some ribbon mics that can handle the abuse but they’re few and far between – and very expensive. The frequency response of a microphone is a very important consideration of choosing your ideal kick drum microphone. Frequency response refers to the pitches a microphone can accurately represent. Bass drums can easily reach down to 20Hz, which is the lowest end of human hearing. 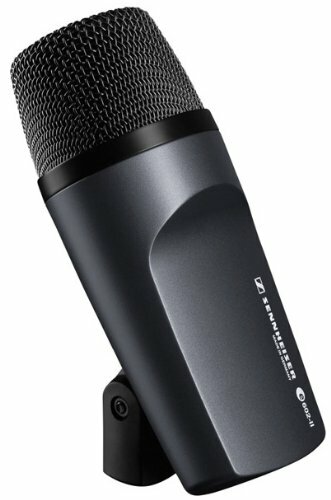 The normal “go-to” mic for instrumental recording, the Shure SM57, only reaches down to 40Hz. This is the general problem when choosing a kick drum microphone. Many dynamic microphones don’t offer accurate enough frequency response. A microphone specifically designed for kick drum is really your best bet, and they offer a nice middle ground between durability and tonal accuracy. Pay attention to the sound pressure level (SPL) a microphone can handle. SPL ratings are measure by the amount of decibels (dB) a mic can handle before it starts distorting. Lower frequencies tend to distort sooner than higher frequencies. A kick drum played loudly can exceed 140 dB, which is likely to distort your average vocal microphone when you’re dealing with frequencies below 100 Hz. Kick drum microphones typically have very high SPL ratings in order to create an accurate reproduction of your drum’s sound at low frequencies with high dB ratings. Typically, dynamic microphones have higher SPL ratings than condensers. Condenser microphones feature electronic components that can be overloaded with too much power. Dynamic microphones, on the other hand, only start to distort when they are physically overloaded. Whether you are a professional sound engineer or you’re just getting your first microphone, you’ve probably heard of Shure. Many of Shure’s microphones, like the venerable SM57 and SM58, are industry standards. As far as kick drum mics go, the Shure BETA 52A deserves the same status. Shure designed this microphone specifically for use on kick drums, and it certainly does the job well. It’s frequency response ranges from 20 Hz to 10,000 Hz, which comfortably captures the tonal spectrum of any bass drum. This mic is designed to have a slight boost around 4 kHz to help the low-end sounds cut through the mix a little more. The BETA 52A does have more proximity effect than other bass mics, which works well on a kick drum but limits the microphone for being used with other low-end instruments like bass guitars. This is a sturdy dynamic microphone that’s built like a tank. You won’t need to worry about the BETA 52 getting damaged from consistent use. It also has an impressive max SPL of 174 dB, so overpowering this thing is no easy task. I’ve used this microphone in indoor and outdoor settings and have never had a problem with distortion. One great feature this mic has is its integrated stand mount, which is easy to use and holds up well to abuse. Many other bass microphones also feature an integrated stand mount, but this is the only one that includes a thumbscrew for quick adjustments. Bottom Line: Just like the iconic SM57/58 microphones, the Shure BETA 52A deserves its spot at the top. Great sound and even better durability make this mic a solid choice. Many consider this microphone to be the industry standard for kick drums. 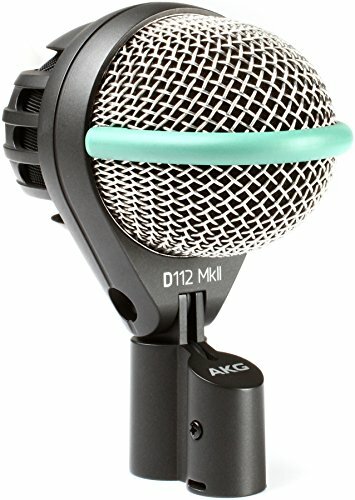 Originally based on the D12, a vintage broadcast microphone, the AKG D112 MkII is a microphone that offers a little more diversity than the others on the list. First of all, its frequency spectrum is pretty broad. The D112’s frequency response ranges from 20 HZ- 17 kHz. It’s specifically built for kick drums, but its wider frequency range makes it a strong microphone to use on other low-end instruments. Like the Shure BETA 52A, it has a boost around 4 kHz to add definition to low end instruments. It’s also the lightest microphone on the list. This may not seem like a major feature, but if you run out of short stands and need to use a full-sized boom stand, you’ll be happy to have something that doesn’t tip the stand over. The D112 also has an integrated mic clip, but the clip does not include a thumbscrew. This isn’t a major flaw, but it means you’ll need a screwdriver to adjust it. This mic’s max SPL is 160 Db. And while there are some microphones that have slightly higher Db ratings, you’re not likely to ever reach volumes that high. Bottom Line: This is an industry-standard kick drum mic with a broad frequency range that also makes it great for recording other low end instruments. The Electro Voice RE-20 wasn’t originally designed to be a kick drum microphone, but it’s become a popular choice amongst many drummers and sound engineers. This microphone is most commonly associated with broadcasting use, but it’s a very durable mic with some features that set it apart from the other microphones on this list. If you’re looking for a more controlled kick drum sound without too much bass, this microphone works very well. Its frequency range reaches from 45Hz to 18 kHz. It also uses Electro Voice’s “Variable D” technology, which makes it immune to proximity effect. This is a nice feature considering how close microphones need to be to a kick drum. If you’re looking for a big, boomy bass sound, this might not be the best microphone for you to work with. But it does very well in jazz or acoustic settings where a more controlled bass sound is the goal. This microphone also works very well in myriad other applications. 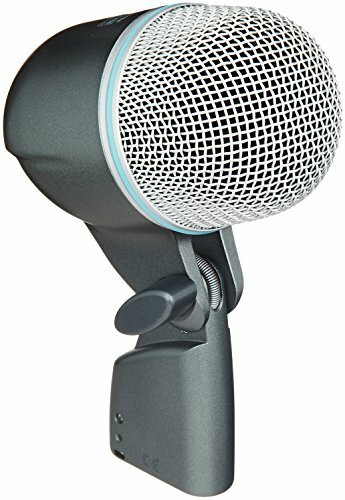 I’ve seen this microphone used to record stand up bass, vocals, and guitar to great effect. Bottom Line: If you want a microphone that records a controlled kick drum sound – and can be used to record other instruments effectively – the RE-20 is a really good choice. The Sennheiser e602 II is a dynamic microphone that features a humbucking coil design. If you’re a guitar player, you’re probably familiar with the term humbucker. A humbucker is a coil design that bucks, or eliminates, excess hum and electrical noise. This makes the Sennheiser a great option for live playing where you may be dealing with bad wiring in old venues. The humbucking coil helps keep a clean signal coming from the microphone. This mic also has a pretty broad frequency response ranging from 20 Hz to 16 kHz, making it versatile enough to handle bass cabs, low brass, or other low-pitched sound sources. It also has very good sound rejection. It’s hard to find a kick microphone that doesn’t pick up too much from the other parts of the drum set, but this mic does an impressive job keeping the kick isolated. All in all, this is the best bass drum mic for live gigs. The Sennheiser is also very durable, lightweight (0.71 lbs), and well-balanced. It can be used on full-sized boom stands with it knocking the stand over, and it can take a beating. Like the AKG D112, you need a screwdriver to tighten the stand mount. Bottom Line: If you need a durable and versatile mic for live gigs that gives you clean sound on a variety of low instruments, this mic is your best bet. And now for the budget pick, we have the CAD D12. This microphone is very affordable, and offers great sound and impressive frequency response (30Hz to 12kHz) for the price. This microphone has more boom and a little less depth and articulation than the other microphones on this list, but it still pumps out good tone with a lot of power. This is the perfect microphone if you’re looking for a budget entry into the world of bass mics. It’s also a great choice as a backup microphone or if you don’t want to take anything too expensive to a live gig. This little mic performs well live, but it struggles a bit with depth and articulation in the studio. 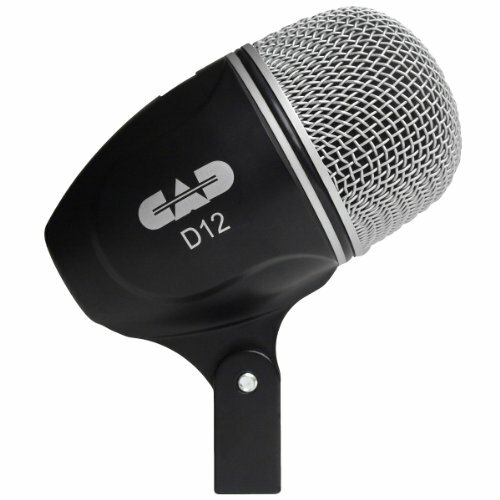 Like many of the other microphones on this list, the D12 features an integrated mount. Bottom Line: An awesome budget kick drum mic that’s a great choice for live playing. If you’re at all serious about your music, using your singer’s old mic to amplify your bass drum just won’t cut it. You need a dedicated microphone to capture those drum sounds clearly and without distortion. And there are plenty of brands that make incredible kick drum microphones at prices that are probably lower than your cymbals. This list is a great starting point to help you get an idea of what kind of kick drum microphone will fit your needs and genre so you can get the best kick drum mic for you. If you take your time, do your research, and read our kick drum mic reviews, you should be able to find a mic that will fit your needs. We always recommend demoing microphones when possible, but the mics we list here are always a safe bet.